Visiting the Regional Command North of ISAF in Camp Marmal in Mazar-e-Sharif in Afghanistan and the soldiers of the German Armed Forces (Bundeswehr) stationed there, you get a good impression of the achievements and professionalism of the Germans at the front and the improved situation in the north. With about 5,000 soldiers in Afghanistan - which have suffered 47 casualties since 2001- Germany supplies the third largest force after the U.S. (90,000) and the British (9,500 ISAF plus special forces 11.000 total). It is responsible as lead nation for the ISAF Regional Command North, a region with 8 to 10 million people and 162,000 square kilometers, an area half the size of Germany. They contribute two Provincial Reconstruction Teams (PRT - in Kunduz and Feyzabad) and a Provincial Advisory Team in Taloqan. Other PRTs in the north are under Swedish (Mazar-e-Sharif), Hungarian (Pol-e Khomri) and Norwegian command (Meymaneh) with a new one planned in Jowzjan Province which will be led by Turkey. ISAF gained greater freedom of operation through the augmentation of more forces and the buildup of the two strong Task Forces in Kunduz and Mazar-e-Sharif with 650 to 700 fighting Germans each and a high rate of operational improvements which involved all 16 nations and the civilian planning as well. In the headquarters of the 209th Corps of the Afghan National Army. 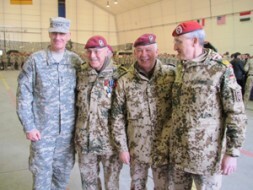 From left: Col. Jürgen Joachim von Sandrart (Senior mentor), the corps commander BrigGen. 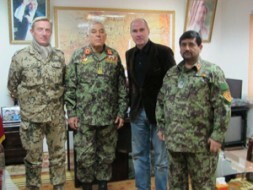 Zalmai Wesa, Dr. Hubertus Hoffmann, and Deputy Corps Commander BrigGen. Sana ul-Haq Bader. The German Air Force operates the important airport in Mazar-e-Sharif which has now become one of the largest airfields and ISAF bases in Afghanistan. In April 2010 the Luftwaffe introduced two brand-new Heron drones here which are flown via remote control by German officers. They can operate 24 hours in the air and identify targets for ground forces in real time operations. More than 300 missions have been flown successfully with this futuristic flying bird. After the transfer of command from Major General Hans-Werner Fritz on February 24, 2011, RC North is now under the command of Bundeswehr Major General Markus Kneip with U.S. Army Brigadier General Sean P. Mulholland as his deputy. They are responsible for nine provinces stretching 900 kilometers east to west and 400 kilometers north to south. Included are 14 cities (like Mazar-e-Sharif or Kunduz) and 9,000 small villages. It borders five neighboring countries: Turkmenistan, Uskebistan, Taschkistan, China and Pakistan (see RC North in Facebook for more details). The command controls 10,400 soldiers from 16 different countries, including 4,500 U.S. and German troops each and 1,400 troops from smaller nations like Croatia, Turkey, Finland, Denmark, Sweden, Norway or Hungary, who are fighting shoulder to shoulder in this international ISAF operation. The comradeship between so many nations, including several hundred women, is as impressive as their willingness to take on the burden of 4 to 12 month-long residence in boring camps or dangerous outside patrols. After all improvements in the past accommodation are still very basic, internet use as the gateway to friends and family is very expensive and the food is of such low quality that any worker in a normal factory would rebel against his cafeteria management. Even more care and funds have to be put forth in order to make the stay of soldiers who risk their lives for us all in their camps as comfortable as possible. On the Afghan side, 10,000 soldiers of the Afghan National Army (ANA), 13,000 from the paramilitary Afghan National Police (ANP) and 3,500 Afghan Border Police (ABP) add up to more than 36,000 troops fighting against the insurgents. Together with ISAF they are a Combined Team North (CTN) fighting the insurgents. The north is important for ISAF as the main supply route to Kabul now proceeds via the mountain roads of the Kunduz-Baghlan corridor (instead of the unsafe Khyber Pass from Pakistan). In addition, this area produces plenty of food for Afghanistan. Under the leadership of Lt. Gen. Rainer Glatz, the commander of the German Operations Command in Potsdam, and a leading expert on Afghanistan for the last 10 years, the Germany Armed Forces have sent their best generals, officers, corporals, elite units and new equipment to the front at the Hindukush which shows the priority of this years-long engagement for the government in Berlin and its commitment for success. They are supported by more representatives from the Foreign Office and the Ministry for Economic Cooperation and Development which are now better integrated into the planning process. Until now, each year a stable majority in the German Federal Parliament, including the Social Democrats now in opposition, have voted to extend the mandate for the forces; nevertheless, the majority of the public wants to bring the soldiers back home. The public sees the picture in Afghanistan gloomier than the soldiers on the ground. The insurgency is estimated to comprise just below 3,000 forces. They include not only Taliban, but also frustrated locals, criminals and few foreigners, all elements fighting the government control. The fighting intensity is much lower than in the south due to the fact that the North is dominated by Tadjiks and Uzbeks. They had fought the Taliban even during their regime in the 1990s combined in the strong Northern Alliance. "Not every Pashtun is a Taliban, but all Taliban are Pashtuns" is an argument you can hear from many sides, and reflects the close link to this largest ethnic group in Afghanistan which dominates the south. In the north, you will find only six Pashtun pockets with approximately one million Pashtuns which equals only ten percent of the population. The insurgents cannot win or dominate the north, but stick to improvised explosive devices (IED) attacks and hold only several smaller parts which are being cleaned now step by step. They are not popular, as most people long for education, jobs and peace. A dramatic attack by an Afghan ANA soldier killed three Bundeswehr soldiers on February 18, 2011, but their comrades keep cool under fire, professional and dedicated to fulfilling their tasks. The mood in Camp Marmal is good and calm. Most soldiers would like to continue their duty to further stabilize Afghanistan and not to have lost the lives of their comrades in vain. Change of command in ISAF RC North in Mazar-e-Sharif February 24, 2011. From left to right: U.S. Lieutenant General David Rodriguez (Commander of ISAF Joint Command), departing RC North Commander Major General Hans-Werner Fritz, Lieutenant General Rainer Glatz (Commander German Forces Command Potsdam), and new RC North Commander Major General Markus Kneip. Only in 2009 did ISAF develop a new "Partnering Concept" based on the understanding that the Afghan Security Forces must be increased, trained, mentored and integrated into joint operations so that the Afghans become able to take care of their own security alone in the coming years. There is a three-step approach to this goal: ISAF is the sword to help to clear insurgent territory as support for ANA troops which is finally held by the ANP. Planning and implementation are coordinated with mentors in ANA from ISAF. In RC North, this works well from the 209th ANA Corps level down to the battalion(Kandak). All officers agree that partnering is without alternative, even after the rampage by an Afghan soldier that killed three German comrades. Colonel Juergen Joachim von Sandrart, Senior Mentor of the 209th ANA Corps in Camp Shaheen, - which will become one of the largest barracks in Afghanistan, including the 209th ANA Corps, the 10th US Mountain Brigade, an engineer school and some Bundeswehr units - states that the cooperation with the Afghans is working well and that there is continuing confidence. One has to have understanding for a different mentality and the rapid increase of this Corps from only 2,500 strong in 2008 plus 4,000 in 2009 and another 4000 in 2010 to now approx. 10,000. Newly won recruits stay only eight months before they see their first mission, for which they receive $200 a months. An additional handicap is the recruits' lack of education; many can neither read nor write. And that's the reason for a huge literacy program run by the NATO Training Mission Afghanistan where right now tens of thousands of Afghan soldiers and policemen undergo intensive training in order to better perform their duties. This applies particularly to leadership training. Partnering has proven effective in both of the OPS mission of the last months. Brig. Gen. Zalmai Wesa , commander of the 209th ANA Corps to which the assassin belonged, apologized to the families and friends of the German Army soldiers on WSN TV. He points out that the event saddened his men and does not correspond to the Afghan codex with respect to befriended soldiers. In Operation "Sher Chesan" significant terrain could be secured in the Chahar Darreh District in late 2010. Another important success of the new joint concept of ISAF, ANA and ANP was operation "Jadid" in November 2010 at Pol-e-Khomri in Baghlan Province, where for the first time ISAF was able to clear and ANA and ANP able to hold a larger former insurgent territory. Now Combined Team North is moving to the next stage, the "build phase". A second OPS offensive named "Nawroz" started days ago to clear the road and valley near Qandahari. ISAF needs to fight for the freedom of movement on this important highway south to Kabul. More joint operations will certainly follow later this year to oust the insurgents from the important Highway 1 in the west, which could not be finished due to insurgents' activities. The sending of 5,000 U.S. troops to RC North only eight months ago was critical for the success of the ISAF forces which were underresourced until then. They are needed for helicopter support as well as medical emergencies and additional firepower. The Germans are very pleased to have the Americans at their side and decorated their courageous medical evacuation team with the highest military award. The cooperation works very well. The U.S. forces are building a huge additional complex in Camp Marmal and have already stationed 2,500 soldiers there. It shows that they see the north as essential for the U.S.-Afghan peace strategy. Here the Insurgency is weakest and a victory could be denied to them for many years to come following 2014. The airfield is key and could remain as a large U.S. base with a bilateral agreement. At the NATO summit in Lisbon in 2010 Germany declared her commitment until the end of 2014 (the transition target date), but might reduce troop levels "according to the situation on the ground" starting at the end of this year. After 2014, the focus will be on training and civilian support. Any reduction should be "not calender driven, but based on conditions on the ground", demanded ISAF Spokesman Brigadier General Josef Blotz as well as retired NATO general Egon Ramms in a WSN TV interview. Berlin has doubled its funding for civilian projects to now €430 million per year. Germany spent €1.2 billion for Afghanistan between 2002 to 2009 and will release another €1.6 billion within the next four years. In the north, main projects are the central hospital (580 beds) and the civilian airport in Mazar-e-Sharif, told Kai Henning, the Senior Civilian Representative in RC North. In OPS Jadid he had spend USD 6,1 million for 77 small projects in a short time to show progress to the local people who are involved in the selection process and get jobs as well. In total, 250 civilians from Germany and 400 from the US work in the north. The cooperation with the Senior Civilian Representative and ISAF is excellent and has become more efficient. On the ground, the real picture in North Afghanistan is brighter than reflected in the overly pessimistic media and the public. The German Armed Forces' "mission impossible" seems to become a possible task now if given more time for implementing success. *This newsletter is dedicated to thank Georg Missulia, Konstantin Menz and Georg Kurat for their engagement and sacrifice for a better world for the people of Afghanistan and us all. These three German Bundeswehr soldiers were killed on February 18, 2011, at the outpost 'OP North' in the Regional Command North of ISAF in Afghanistan by a soldier of the Afghan National Army in a rampage. Dead end for US - Pakistan alliance?